In addition to the purple packaging, the 1993 Proof Set included a purple card stock insert. 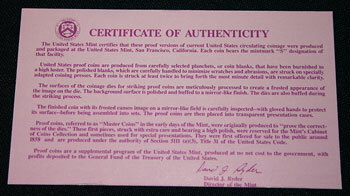 On the shiny side of the card, the Certificate of Authenticity message from the US Mint is printed in small, purple font with the US Mint's seal in the upper left corner. The United States Mint certifies that these proof versions of current United States circulating coinage were produced and packaged at the United States mint, San Francisco, California. Each coin bears the mint mark “S” designation of that facility. United States proof coins are produced from carefully selected planchets, or coin blanks, that have been burnished to a high luster. The polished blanks, which are carefully handled to minimize scratches and abrasions, are struck on specially adapted coining presses. Each coin is struck at least twice to bring forth the most minute detail with remarkable clarity. The surfaces of the coinage dies for striking proof coins are meticulously processed to create a frosted appearance of the image on the die. The background surface is polished and buffed to a mirror-like finish. The dies are also buffed during the striking process. The finished coin with its frosted cameo image on a mirror-like field is carefully inspected—with gloved hands to protect its surface—before being assembled into sets. The proof coins are then placed into transparent presentation cases. Proof coins, referred to as “Master Coins” in the early days of the Mint were originally produced to “prove the correctness of the dies.” These first pieces, struck with extra care and bearing a high polish, were reserved for the Mint’s Cabinet of Coins Collection and sometimes used for special presentations. They were first offered for sale to the public around 1858 and are produced under the authority of Section 5111 (a)(3), Title 31 of the United States Code. Proof coins are a supplemental program of the United States Mint, produced at no net cost to the government, with profits deposited to the General Fund of the Treasury of the United States. 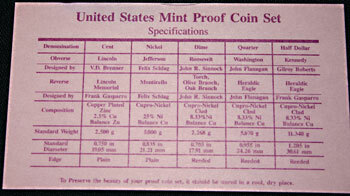 On the matte side, a table shows the specifications for each of the five coins included in the 1993 Proof Set. To preserve the beauty of your proof coin set, it should be stored in a cool, dry place. Click 1993 Proof Set to view the contents of the proof set package.